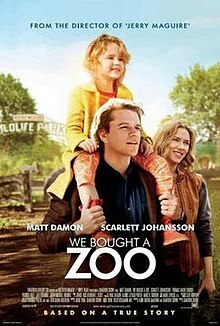 I had a chance to watch the movie We Bought A Zoo. The film features Matt Damon and has easily become one of the best movies I have seen in a long time. The movie is a real authentic look on life, one that is sometimes humorous but serious with expectations of dreams and hope while living through sadness and darkness. That seems to be real life. I suppose that is why I enjoyed the film so much. I have found that life is full of so many great memories as well as great expectations. Yet the more I live life the more I am personally aware that some days bring dark clouds too. My hunch is that you life shares that same plot as well. In the movie Damon plays Benjamin, who is a writer, a widowed husband, and a father to two young children named Dylan and Rosie. As a family they are trying to carry on after the death of the mother has died from an illness. So they sell their house in the city and buy a dilapidated zoo. Of course, this new adventure will be far from peaches and cream. On paper it seems so easy to start over but in real life it is never so easy. How can we let go of the past when in our hearts we want nothing more than the past…to go back to those happy days? We might try pretending as though life goes on but “out of sight, out of mind” never works. Some memories are too powerful to forget and too wonderful to want to forget, which is what makes it hurt. That is partially true but it is partially wrong too. It is true that we are always living the story in the present but that does not erase the stories of the past that are part of the story. Benjamin would like too forget because it seems easier to carry on with life that way. Yet his teenage son, who is having a very difficult time, will not let him. You will have to watch the movie to see how everything plays out. All that I will say at this point is that Benjamin and his children along with the help of some friends learn to stop running from past which has become the painful present. In embracing their story, past and present, they find the way forward which gives them new stories to the story they are living. At a time when Israel’s story was engulfed by grief and disappointment, the Prophet Habakkuk neither ignored the past nor the present but dealt with Israel’s troubled life in a real and honest way. God spoke in mysterious ways. The Prophet says, “The mountains saw you, and writhed; a torrent of water swept by; the deep gave forth its voice” (Hab 3:10, NRSV). Some how, by refusing to run from the dark clouds, Habakkuk heard God’s voice within the darkness and then the past and present gave way to a hope for the future. That is life. That is the story we live. Embrace it. Embrace it when it makes you laugh and embrace it when it makes you cry. Because in both the sunshine and the rain, God is there revealing the way forward…the future of our story, where hope is. This entry was posted in Contemporary Culture, Faith, Hope, Scripture, Suffering. Bookmark the permalink.